Sweatshirts are a wardrobe’s best friend. They are relaxed, versatile and very comfortable. However, contrary to what most people think, sweatshirts can also be worn stylishly. For a truly relaxed and stylish look, you can pair sweatshirts with skirts, shorts (both casual and glitter), trousers and off course dresses. 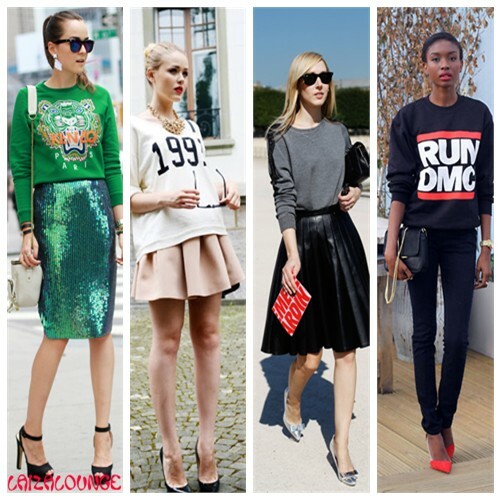 Sweaters in general can work perfectly for that office look, ‘street style’ and fashion week outfit. There are several ways to style ‘sweatshirt outfit’; one is by accessorizing correctly. Sweaters can be styled by adding accessories such as a belt, jewelry and off course that unique bag or clutch. You can pair sweaters with a chunky necklace and tribal or other unique bracelets to make a statement. In addition, for that simple but classy look, you can use a statement clutch to complete your desired look. Some sweatshirts have bold graphics on them; in this case, keep your accessories on the ‘low’. I put together three looks to demonstrate how you can stylishly wear those sweatshirts. This look was inspired by the lovely blogger Levi Nguyen . Not everyone is bold enough to wear a sweater and a long dress or skirt. In the picture below, she wore a sweater on top of a long high-low dress. This look was complete with the right statement necklace. I put together a similar look below, but instead of a dress, you could pair the sweater with a long skirt. The third look was inspired by Elena Perminova. She wore a Kenzo sweatshirt with jean shorts and a statement necklace, during Fashion Week. See a similar look below. Style Tips! How to Rock a Crop Top! InspirationTalk! Leave Your Comfort Zone! Style Post: The DOT Bag Series! STYLE LOUNGE: Get the DenimSpired Look!